Noelle Marie Amendola is an inspirational speaker, singer, songwriter, and author who, after a life of insecurity and pain, wanted to bring joy and bliss back to the world. 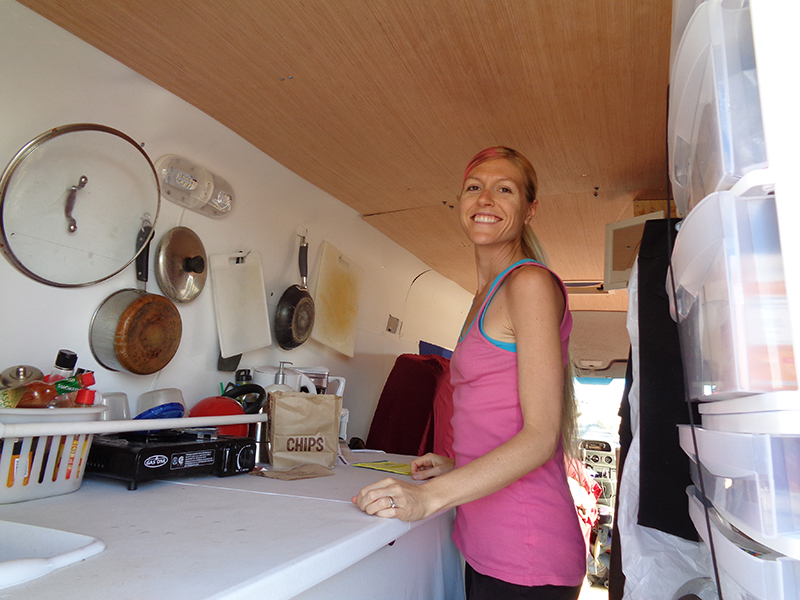 Noelle Marie and her husband left behind their 3,000 square foot home to live a simple life in a converted Sprinter van. The entire conversion process only about a week and can be seen on Noelle Marie’s YouTube channel. 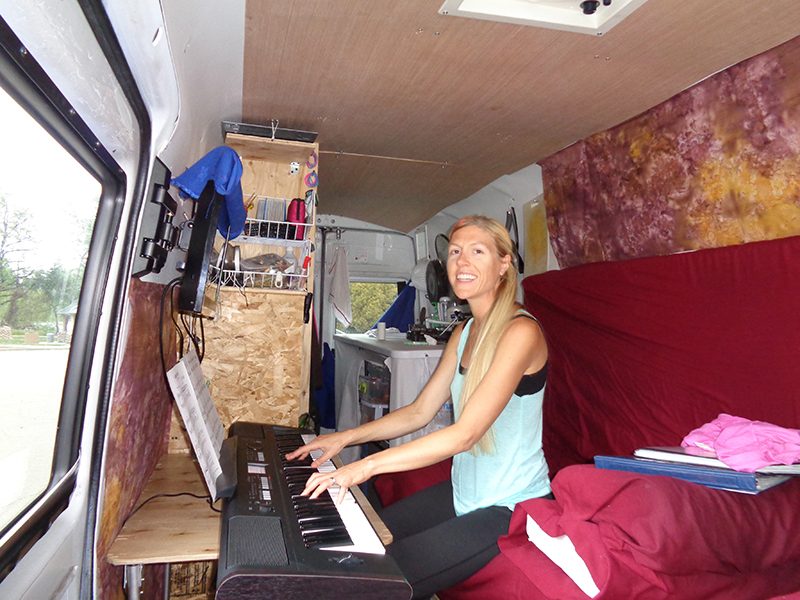 Noelle Marie and her husband Vince converted their van in record time. 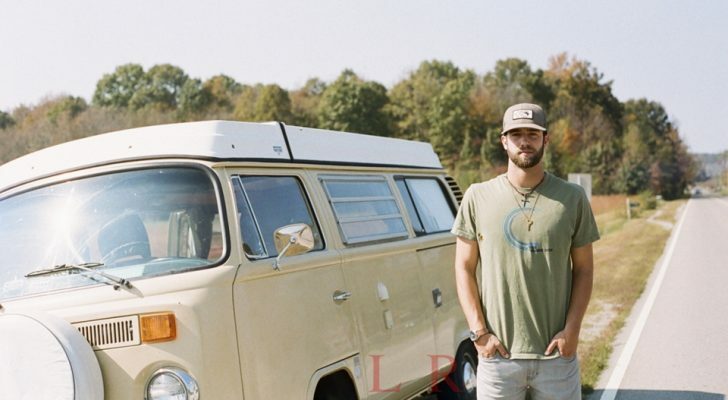 The couple now travel and camp around the U.S. promoting Noelle’s book and her speaking engagements as well as performing at various locations around the country. 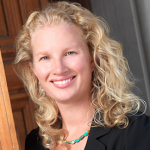 Noelle Marie is a singer, musician, inspirational speaker, and author. 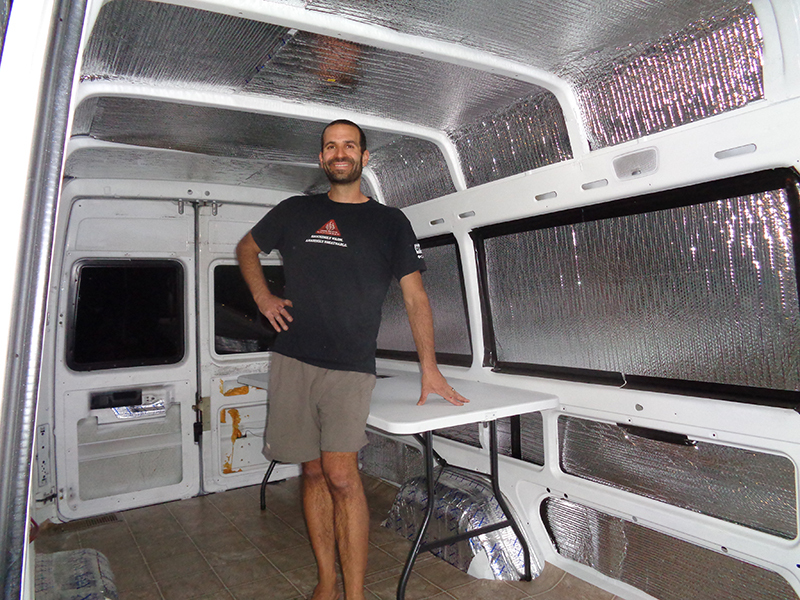 After purchasing the van, Vince quickly set to work converting it into a tiny house, and purchased most of the materials from local box stores. 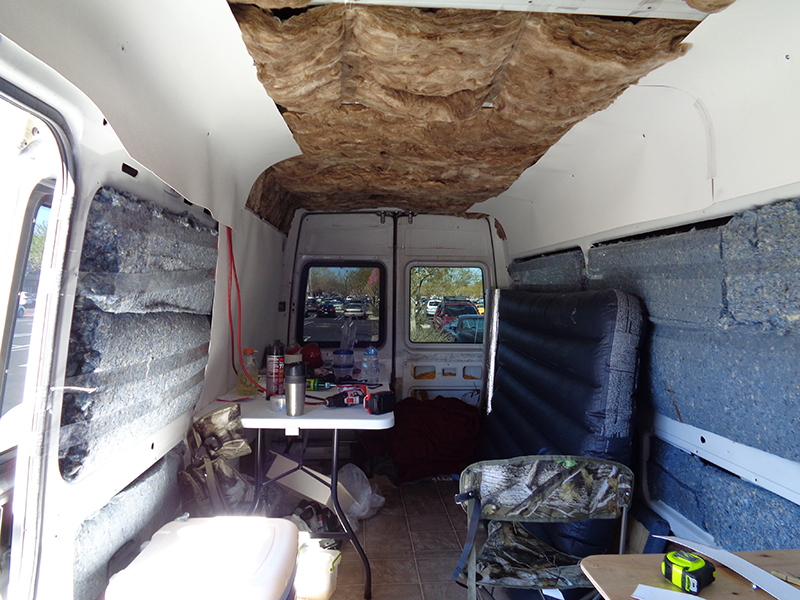 During the one-week conversion process (completed in a parking lot) Vince installed a skylight with a roof fan, floor vents, insulating Reflectix in the floors, walls and ceiling, and a plywood subfloor with laminate flooring. The walls, windows and ceiling were insulated with denim rolls and fiberglass taped down and covered with waterproof luan plywood. 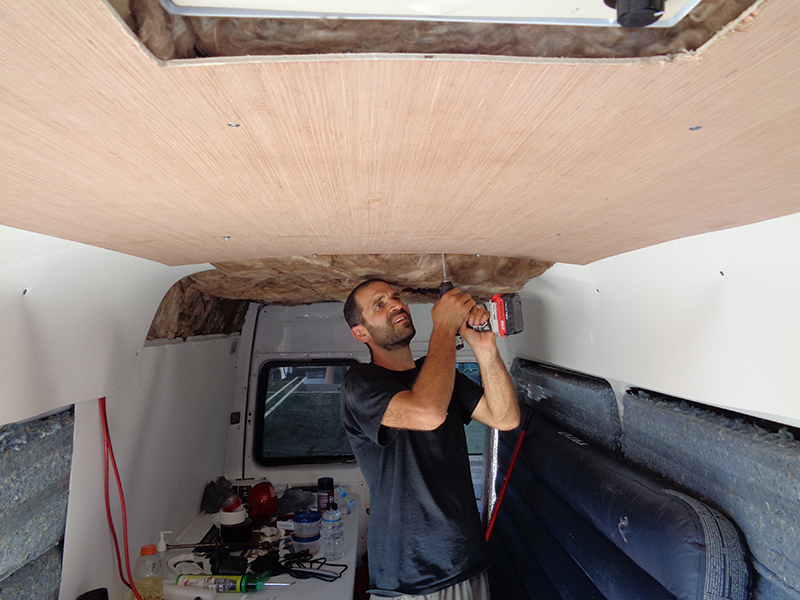 The Sprinter received a full makeover with insulation and a new floor. Vince also built the couple’s futon bed that converts into a couch during the day. Underneath the futon is a ton of storage for Noelle’s piano, books and extra clothing. 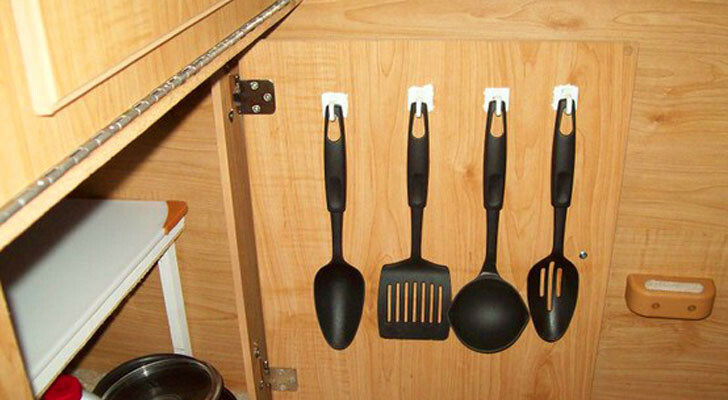 The closet area is in front of the kitchen and was made out of plastic storage boxes and a plywood framed area. 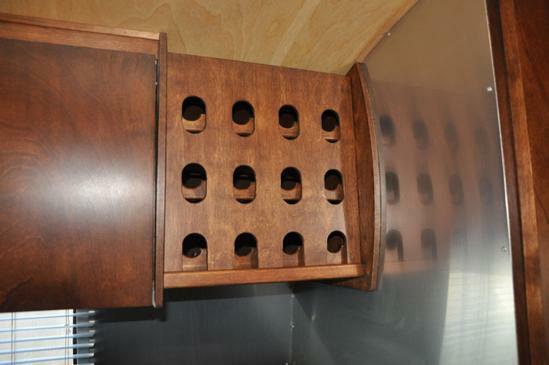 The framing contains the closet as well as the inverter and the charge controller for the roof solar panel. 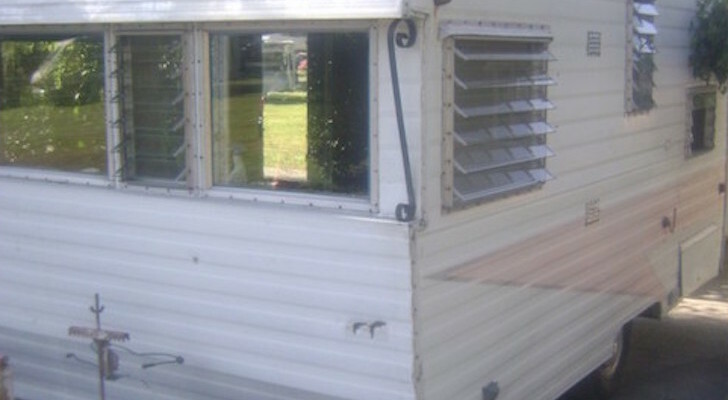 Vince used Reflectix for its reflective insulating purposes. 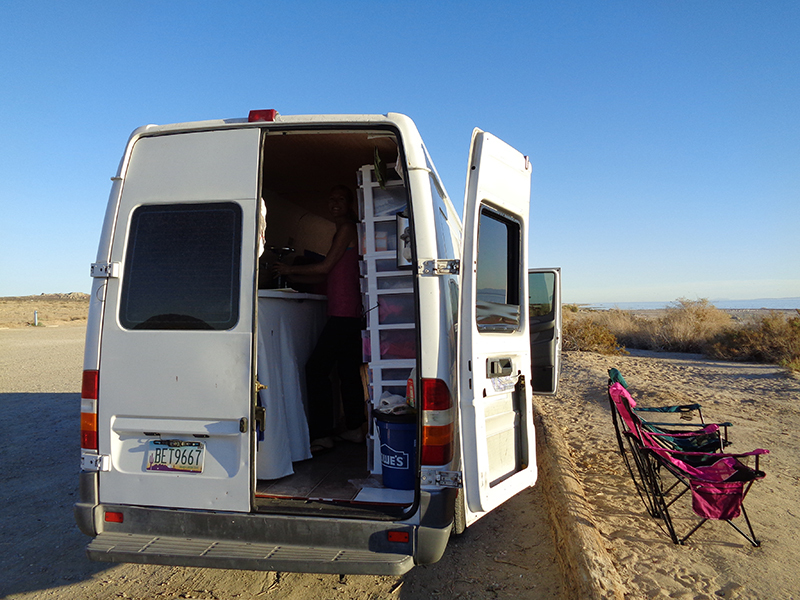 The van’s back kitchen is a plastic folding table with a small stove, storage, and a sink with an ingenious foot pump design. 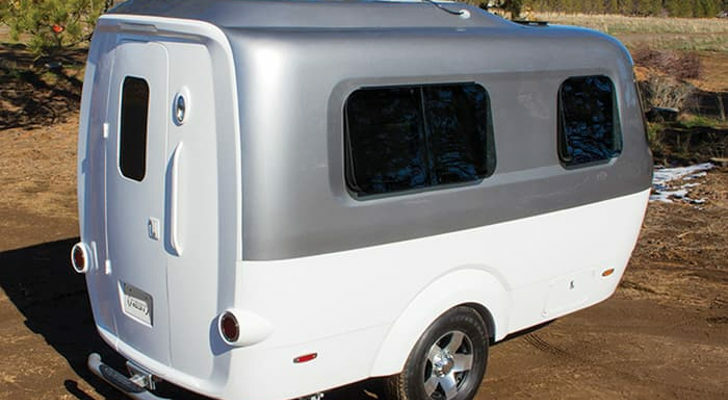 The kitchen refrigerator is an EdgeStar design that runs off the solar panel, and water is stored in portable water containers. 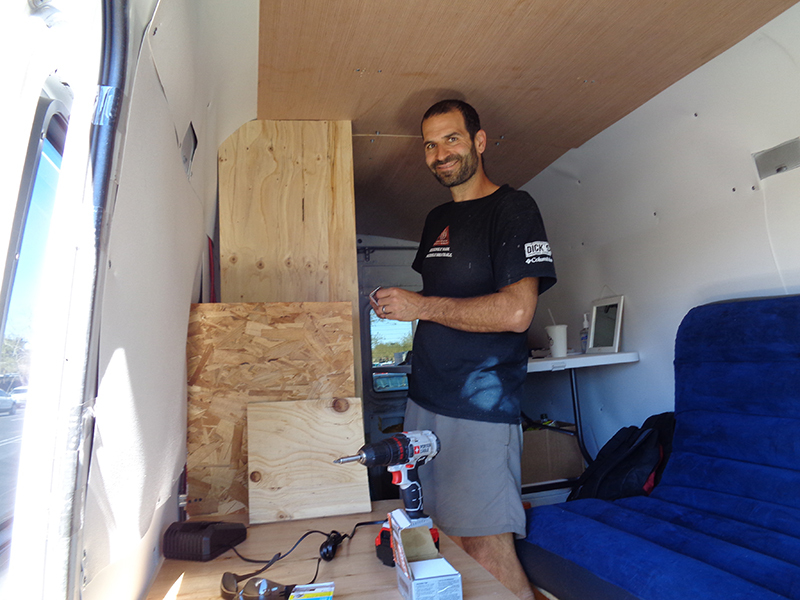 The van’s closet holds clothes, a portable toilet and the solar panel components. Some final touches for the home include privacy curtains, a simple wooden shoe rack, some portable dining chairs and table, and a handmade composting toilet with a urinary director for the ladies and a lime bucket for odors. The kitchen has an ingenious sink operated by a foot pump. 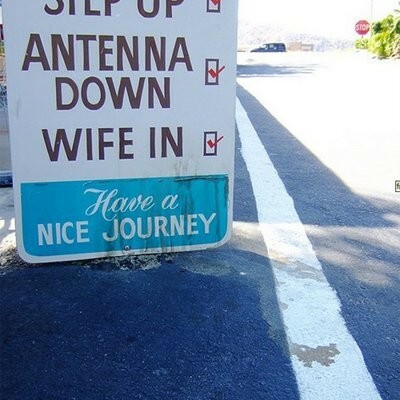 Noelle and Vince’s videos also document the nitty gritty details of life on the road. The couple show how they get fresh water into their portable water containers: with a dolly and a universal faucet adapter that connects to any type of safety faucet. They also document how they cook in the back of their van, how they make money on the road, and several run-ins they’ve had with local law enforcement. 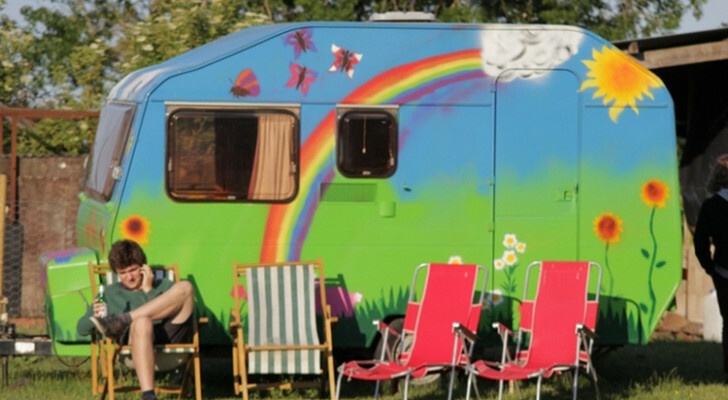 Noelle Marie and Vince now live a simple life on the road. This is not the first time the couple have lived the mobile life. 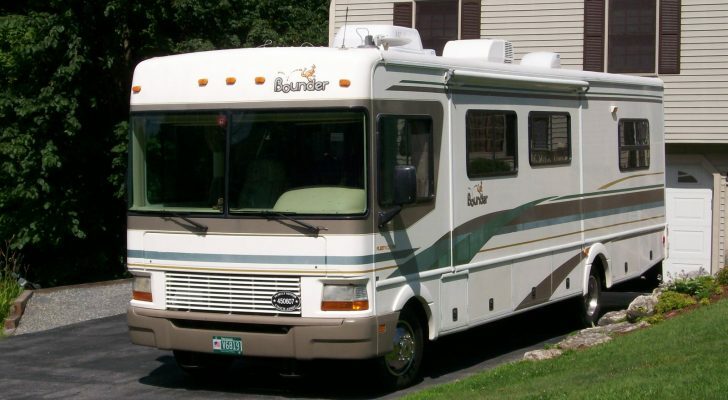 Before the van, Noelle Marie and Vince lived out of a converted school bus for over a year before they downsized even more and moved into their new home. 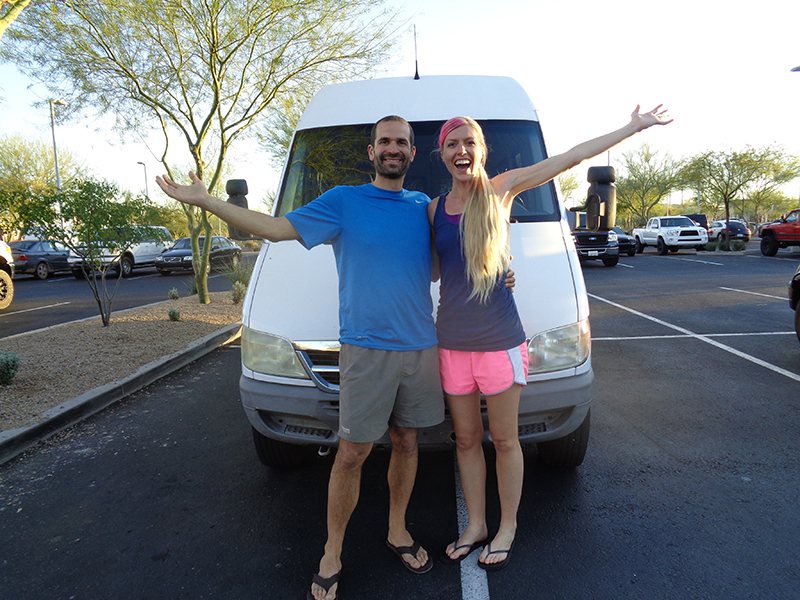 Noelle and Vince actually purchased the van from another YouTube blogger, Happily Houseless, as a basic, empty frame ready to turn into a small, mobile home.